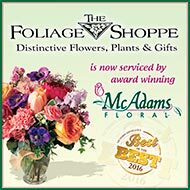 The Foliage Shoppe is now part of McAdams Floral who is the premier flower shop in Victoria, Texas (TX) and was voted Best of the Best florist by readers in The Victoria Advocate 2000-2017 newspaper poll. The Foliage Shoppe Florist on 3305 Sam Houston was acquired by Stanly Schwecke in 1994, after starting his Texas TX floral drive at Victoria House of Flowers when he was 17. The Foliage Shoppe is now part of McAdams Floral who is the premier flower shop in Victoria Texas TX, and was voted Best of the Best Florist by Victoria Advocate readers 2000-2017.